Published: Feb. 22, 2014 at 07:50 p.m. Updated: Feb. 22, 2014 at 08:22 p.m.
INDIANAPOLIS -- He stood at the podium with his head held high, his voice projecting poise and confidence, his statements full of reason and devoid of defensiveness. As coming-out parties go -- so to speak -- Michael Sam's first press conference since publicly acknowledging his sexuality was an impressive display of maturity. With so much noise surrounding his attempt to become the NFL's first openly gay player, the former Missouri star injected a strong, steady and undeniably human voice into the fray, and the sports world was better for it. In response to questions hinting at the less evolved elements of football (and societal) culture, from potential workplace harassment to outright intolerance, Sam had an adult conversation with the overflowing crowd of reporters at Lucas Oil Stadium on Saturday afternoon. He won the room with semi-self-deprecating sincerity, asking to be judged first as a football player trying to find a job. "I just wish you guys (would) see me as Michael Sam the football player, instead of Michael Sam the gay football player," said Sam, one of more than 300 prospects going through drills, interviews and medical exams at the NFL Scouting Combine. Because of the way Sam handled himself on Saturday -- and, presumably, will conduct himself in private interview sessions with various NFL teams over the next several days -- there is a much better chance of that happening, and sooner than some people might imagine. The world is changing; indeed, it already has. "To me," one NFL owner told me Saturday, an hour after Sam's press conference had concluded, "this is so 1990s. In today's world, I really don't think it's that big a deal." Yet as a 24-year-old being cast as the 21st century Jackie Robinson, Sam has every reason to be a bit skittish and unnerved by his situation. Based on what we saw on Saturday, he's either pretty good at concealing stress or isn't feeling as much of it as many of us expected him to. Unlike Manti Te'o, who came off as sheepish and uneasy during a similarly packed press conference a year ago in the wake of the circus surrounding his imaginary-girlfriend scandal, Sam didn't appear to be a young man under siege. If anything, he seemed happy to be there. Then again, it helps when you're not hiding anything, or trying to explain away inconsistencies in past statements. The truth shall set you free -- and make you a lot more comfortable under the lights. Sam answered questions head on, said what he wanted to say and might as well have dropped the mic as he left the stage. Instead, he finished by telling the assembled reporters, "God bless you guys." Perhaps he was playing to the crowd, but in a sports world in which some athletes treat media members like IRS agents who perform unscheduled root canals, it was nonetheless a nice touch. Fifteen minutes earlier, Sam had begun his press conference by introducing himself to the group -- then, almost immediately, he started fielding charged questions. Would you be hesitant to be in the Miami Dolphins' locker room (given the Richie Incognito/Jonathan Martin saga)? "If the Miami Dolphins drafted me, I (would) be excited to be a part of that organization, but I'm not thinking about going into that environment," Sam said. "I know how to handle myself. I know how to communicate with my teammates. I know how to communicate with the coaches and know the staff, whoever I need to communicate with." Later, Sam addressed the topic once more, saying, "I've been in locker rooms with all kinds of slurs being said. I don't think anyone means it. "As time goes on, everyone will adapt." Will people be able to joke with you about your sexuality? "Everyone can be normal around me if they want to," he said. "We joke around because it's a brotherhood, we're a family. We can say things to each other. No harm, we don't draw blood. It's all fun and games." If someone says something offensive, will it lead to a fight? "A fight?" Sam answered, somewhat incredulously. "If somebody wants to call me a name, I'll have a conversation with that guy and hopefully it will lead to nothing else." Unlike some public figures trying to diffuse a media firestorm, Sam wasn't trying to be boring. He even threw in some humor, with himself as the punch line. Asked about the standing ovation he received at a Missouri basketball game shortly after coming out, Sam said, "I love my fans. I love Mizzou ... After what they did this past weekend, it was just amazing. I wanted to cry, but I'm like, 'I'm a man.' "
People laughed. It was funny. And it was part of Sam's generally positive and hopeful presentation, instilling a sense in his audience that if he's not freaking out about this situation, there's a legitimate chance that the vast majority of the people around him won't, either. Asked how the reaction has been since he revealed his secret to the masses -- six months after having told his Missouri teammates, none of whom went public with the news -- Sam smiled and said, "Great. The positive outweighs the negative. I'm kind of surprised, actually. There's a lot of supporters, a lot of people want this. Just a lot of support out there." After Saturday, I believe, there will be more support for Sam. Like many former college standouts, he'll be scrutinized and poked and prodded at the combine and in the months leading up to the draft, but after talking to more than two dozen coaches and general managers about Sam, I don't believe his sexuality is going to be an issue. Sam will be stereotyped -- as a tweener, an edge rusher too light to play defensive end and not necessarily suited to lining up as an outside linebacker in a 3-4 defense -- but chances are he won't be blackballed or marginalized because he's gay, or even because he's a potential distraction. 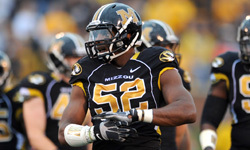 And from what we saw on Saturday, Michael Sam the football player isn't planning on entering the NFL timidly. "I'm a pass rusher," he said. "So if you put me in a situation to get the quarterback, I'm gonna get the quarterback." In the meantime, when it comes to standing tall and seeming comfortable in his own skin, Sam most definitely gets it, period. At one point, repeating a slogan from a rainbow-colored button he wore around his neck -- an apparent gift from a supporter -- Sam said, "I hope all of you guys 'Stand with Sam.' Please do." After watching him handle his business on Saturday, I most definitely will. I have a feeling most of his peers will, too.